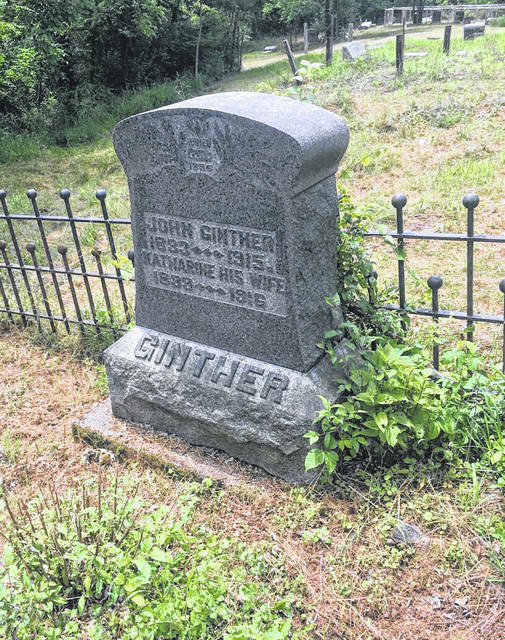 John and Katherine Ginther’s grave at Brown Cemetery. I’ve always believed that history is so much more than what finds its way into our history books, so much more than the great men and women that we learn about in school. In our case, our county’s history is so much more than George Washington, Andrew Lewis, John McCausland, or Olivia Poffenbarger. Now don’t get me wrong, their stories are extremely important. Washington surveyed this county and pushed for western settlement. Lewis commanded the Southern Army at Point Pleasant. McCausland represented the Virginia Military Institute at John Brown’s hanging, served in the Confederate Army with the final rank of Brigadier General, and was at Cloyd’s Mountain, Petersburg, and Appomattox, among other battles. Poffenbarger was editor of the State Gazette and, while not alone, was a major figure in the campaign to have the Battle of Point Pleasant nationally recognized, eventually leading to the designation of Tu-Endie-Wei State Park and construction of the Battle Monument. But what of all the other people that helped build our community? What of the teachers? The blacksmiths and carpenters? The rivermen? The coal miners and salt furnace laborers and mill workers? The seamstresses? The farmers? The slaves? The doctors? If not in the history books, where do we find their story? I tend to start in the local cemetery. Many of us know cemeteries as solemn places of final rest, where we pay our last respects, or as a place of remembrance. I know my family, along with many more, make it a point to visit all of the family graves on Memorial Day and put out flowers. And, if your grandparents are anything like mine, you usually end up hearing a story or two about your great-great-grandparents or an uncle or aunt that you never knew. Of course, as the family historian, that automatically makes it one of my favorite family traditions, but I do have other reasons. Two, actually. First, some unknown person once said, “So long as one person remembers, someone is never truly gone.” I just think that’s a beautiful concept. Second, it reminds you that these were once living, breathing people. Mothers, fathers, brothers, sisters, and children. They lived and worked in your community, and just from that simple fact, they played a part in its history. Starting with just the information on their headstone gives you quite a bit. What was their name? How old were they? Were they a veteran? Were they a member of any fraternal organization (Masons, Odd Fellows, Rebekahs, etc.)? From there, birth, marriage, and death records add more detail. Business directories give you their occupation. Newspapers can tell you pretty much anything, from who they visited last week to the construction of a new home or destruction of an old one. Add it all up, and you have a person’s story, a piece of the community’s story. That said, allow me to introduce you to John Ginther. Born in 1833 in Germany, he was one of the “Forty-Eighters” that came to America following the failed 1848 German Revolutions. In 1850, he joined over 30,000 other “Forty-Eighters” that settled in Cincinnati’s Over-the-Rhine district, named for the large German population. He was joined there by his father and siblings in 1852. In 1855, the family moved to Pomeroy, where John continued his iron foundry work that he had practiced in Cincinnati. It wasn’t long after, on November 10th, 1856, that he and Katherine Kauff were married. He and Katherine had seven children and lived to celebrate their 50th anniversary in 1906. In 1862, following the salt boom that accompanied the Civil War, Ginther moved his blacksmith operations to Hartford. As one of only two blacksmiths in town, he did everything. He maintained and repaired the boilers and machinery at the salt furnace, fashioned iron tools for farmers and laborers, and built many of the wrought-iron fences in town, some of which still survive. Many of these were produced by the Cincinnati Iron Fence Company and assembled by Ginther, but I suspect that the one around his own grave at Brown Cemetery was made by his own hand. He continued his trade until his retirement in 1903. Being such a crucial part of the town tends to make one well-known, and that certainly didn’t hurt when Ginther ran for town office. He served one term as Hartford’s mayor and an impressive thirteen terms on the city council. He was also a member of the Independent Order of Odd Fellows, evidenced on his tombstone by the three links representing friendship, love, and truth. John Ginther died on February 16th, 1915 of “paralysis,” also known as apoplexy or a stroke. The same killed Katherine a little less than two years later, in December of 1916. Information from Mildred Gibbs’ “Hartford City, 1853-1922,” West Virginia State Gazetteer and Business Directory, the Weekly Register, the US Census, and death records.